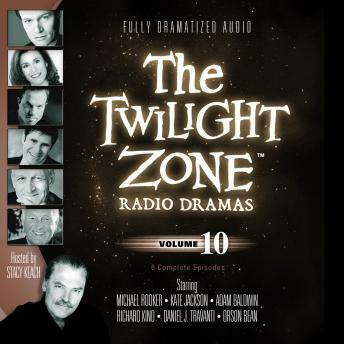 Experience one of television’s greatest science fiction series: The Twilight Zone. This collection of episodes is fully dramatized for audio and features a full cast, music, sound effects, and narration by some of today’s biggest celebrities. A well-loved teacher feels his useful life is over when he is asked to retire—but he soon learns he is mistaken. A commercial airliner is somehow transported back in time to the prehistoric days when dinosaurs ruled the Earth. A man who has lived his life joyously surrounded by loud noise suddenly finds that trivial sounds, such as dripping water, begin to drive him insane. A broken-down gunslinger is given a magic potion that will restore his fast-draw abilities just in time for a gunfight. While driving alone on a cross-country trip, Nan Adams keeps seeing the same hitchhiker all along the way—even though there is no way that he could have gotten ahead of her. Old West lawman Conny Miller visits the grave of a man he failed to track down to prove he was never afraid of him, but he gets more than he bargained for.